If you’re unhappy with the shape of your nose but would like to avoid the downtime, costs and risks of surgery, then dermal filler is a great alternative. This is also a great treatment for those who are considering surgical rhinoplasty and want to see how their new nose could look. 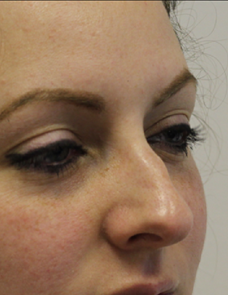 We use Dermal Fillers such as Juvederm, Restylane or Teosyal (depending on the individual case). These contain Hyaluronic acid which is naturally found under our skin and is responsible for firmness and volume. This is placed using a thin needle or cannula to the area which requires filling. Another benefit of using these fillers is that the result can be totally reversed using an enzyme. This provides patients with peace of mind, especially if you have not had filler treatments before. How do I know if the treatment is safe & right for me? We only accept patient for treatment after a detailed consultation, in which we understand your medical history, condition of skin and expected result. After this we are able to determine if the treatment would be successful or not. The fillers used in this procedure, are biocompatible and biodegradable products, which are similar to the type that occurs naturally in the body, which means that it is not harmful to the body and is broken down and removed from the body naturally. The hyaluronic acid comes in the form of a sterile gel produced in the laboratory. 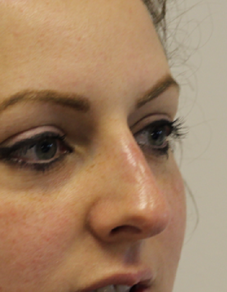 Who carries out non-surgical rhinoplasty treatment? The procedure is carried out by an experienced Dentist who has many years of experience providing these procedures with stunning results. At Skin Cliniq, we perform non-surgical rhinoplasties using trusted Dermal Fillers such as Juvederm or Restylane or Teosyal (depending on the individual case) to achieve the desired result. A consultation will be required with one of our clinicians detailing your concerns and past medical and cosmetic history. Results are immediate and last for up to 18 months, depending on patient metabolism. After treatment you can occasionally get swelling or bruising but these happen infrequently and can either be covered up with concealer or disappear of their own accord within a couple of days. Side effects are rare, mild bruising and swelling might occur, but this usually fades quickly (you can minimise bruising by avoiding medication aforementioned before the procedure). Localised infection (please adhere to the post-treatment advice to avoid infection, antibiotics might be needed in such cases). Individuals with known hypersensitivity (allergies) to dermal fillers, please do not opt for this treatment. In the presence of infection or severe inflammation at the injection sites treatment shouold be delayed. Please inform us if you are taking any concurrent treatment such as laser skin resurfacing, microdermabrasion and chemical peels.